Last year GE Additive launched a unique program called the GE Additive Education Program, where it is investing $10 million over five years in educational programs to deliver 3D printing packages to primary and secondary schools and metal 3D printers to colleges and universities across the globe. In its first year in 2017, GE delivered direct metal laser melting (DMLM) 3D printers to eight colleges and universities. More than 400 K-12 schools each received two Polar Cloud-enabled 3D printers and STEM curriculum. While last year’s program impacted the lives of around 180,000 students across the world, GE Additive Education Program’s (AEP) 2018 cycle is set to impact more than 400,000 K-12 students in 30 countries. The 3D printing package will be awarded to 600 primary and secondary schools in 30 countries. Each 3D printing package includes hardware, software, and science, technology, engineering, art, and mathematics (STEAM) curriculum and will be delivered by 30 September 2018. 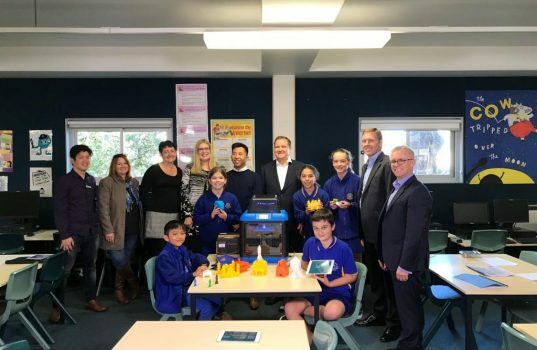 Australia, one of the top five countries with the most package recipients this year, will receive the 3D printing packages in 103 schools. GE is making a significant impact by helping students learn about the 3D printing technology. GE is influencing the lives of more than 400,000 students this year and even more kids in the next three years. Colleges and universities that will be awarded a metal additive manufacturing system as part of the AEP will be announced later this month.